At the turn of the last century, automats experimented with cutting-edge machinery and production techniques, allowing them to serve freshly made dishes at affordable prices to thousands of customers each day. The trendy eateries relied on a novel format combining elegance and efficiency, and were extremely successful in Philadelphia and New York. But if this techno-foodie paradise was so magical, why did we eventually discard it like the cheap paper wrapping on a fast-food hamburger? Records show that the Greek engineer Heron of Alexandria invented a coin-operated machine to parcel out the holy water provided in temples sometime during the 1st century A.D. One of Heron’s surviving books, called Automata, (derived from the Latin “automatos,” meaning “self-moving”) described several impressive machines specifically designed as mechanical “miracles” to impress temple worshippers. However, the automated holy-water device was mostly forgotten until the 19th century, when stand-alone vending machines were adapted for all sorts of products. Top: New York’s flagship Times Square automat as seen on a 1920s postcard. Above: The wartime bustle at Horn & Hardart as captured by J. Baylor Roberts for “National Geographic” in 1942. In 1883, British inventor Percival Everitt was the first to be granted a patent for a modern vending machine, which dispensed postcards and note paper. Five years later, Thomas Adams developed the earliest American vending machines to sell his famous Tutti-Frutti gum on the platforms of the New York City subway. Soon entrepreneurs were designing automata to hawk everything from pencils to apples to perfume. In the 1880s, Max Sielaff developed the first chocolate-bar vending machine for the Stollwerk confectionary. But these mechanical vendors weren’t only popular for their novelty: As more people were employed outside the home and working hours became standardized, urban streets were increasingly packed with commuters who didn’t have time to wait in line at a newsstand, much less to sit down at a conventional restaurant. Nowhere was this more apparent than in bustling East Coast cities like Philadelphia, where a company called Horn & Hardart got its start. In 1888, the same year New York’s train stations got vending machines, Frank Hardart responded to a Philadelphia classified ad placed by native son Joe Horn, who was looking for someone to partner with on a new restaurant venture. Hardart, who was born in Germany, had worked in restaurants around Philly for a few years, but his interest in the food industry began in New Orleans, where he’d learned to brew coffee using the exotic French-drip method. The partners hit it off and opened their first cafe on December 22, 1888, distinguished by a long lunch counter with 15 stools. Hardart’s signature French-drip coffee, which he dubbed a “gilt edge” brew, quickly built a loyal following. Over the next few years, the duo opened several larger, cafeteria-style restaurants throughout in Philadelphia, and in 1898, the company incorporated as the Horn & Hardart Baking Co., with Horn as president and Hardart as secretary-treasurer. There were already other successful cafeterias—like New York City’s famous Exchange Buffet, a men-only restaurant catering to the Wall Street crowd—but Horn & Hardart’s streamlined operation and its inviting, refined environment developed a devoted and diverse clientele. Around the turn of the century, the Horn & Hardart team got wind of a new kind of prepared-food vending machine that was popping up all over Europe. Known as an automat, which literally means “machine” in German, the device had evolved from the world’s first chocolate-bar vending machine, created by German engineer Max Sielaff in the 1880s. Sielaff had quickly developed other applications for the contraption, and at the Great Industrial Exposition of Berlin in 1896, he debuted the first coin-operated automatic restaurant. Though Sielaff’s early designs contained cold food items displayed behind glass, hot dishes were advertised by a written description. 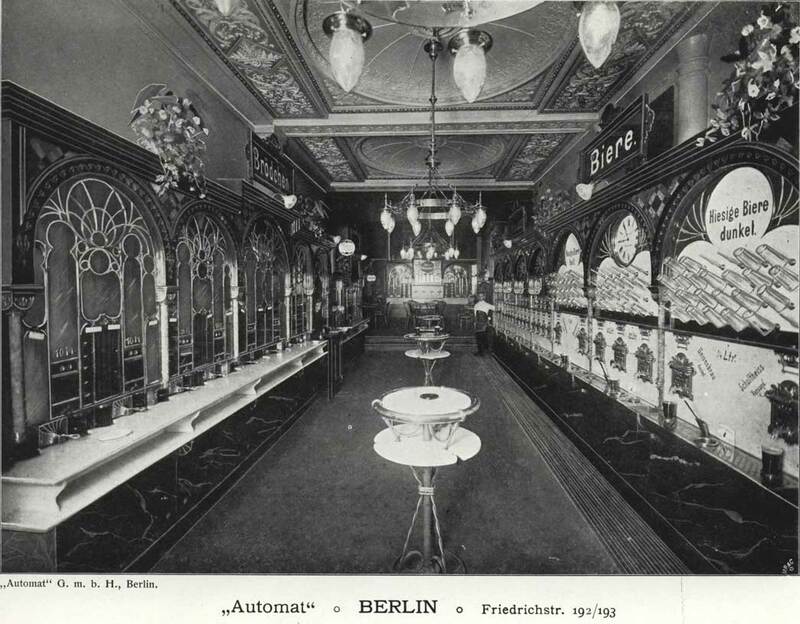 This image from an 1896 Sielaff catalog shows the opulent interior of one of their Berlin automats. Courtesy the Hagley Museum and Library. “These earliest automats relied on dumbwaiter technology, so essentially, there was a kitchen underneath the dining room,” says filmmaker Lisa Hurwitz, who is directing and producing a documentary about Horn & Hardart automats. “It was more about the novelty of the experience than about speed. Historians or academics refer to the automat format as ‘quick service,’ but they don’t refer to it as ‘fast food. '” Horn & Hardart’s first automat machine arrived in Philadelphia in 1902, purchased from overseas as a kind of experiment. 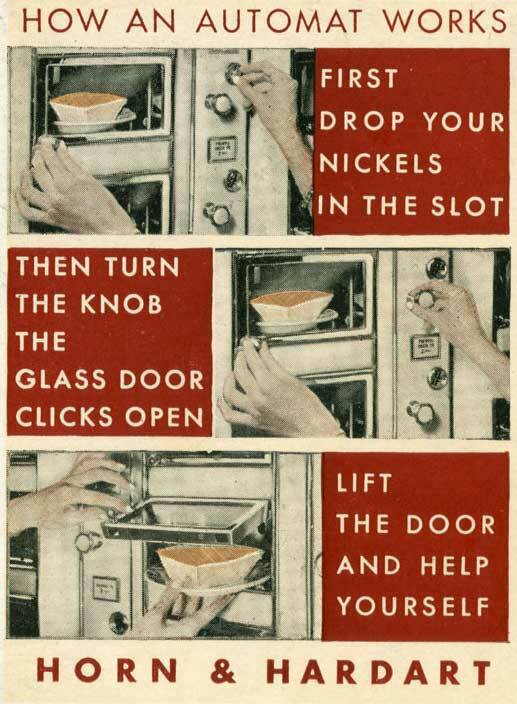 While cold foods could be immediately taken from the automat after inserting a token, customers would have to wait for warm dishes to be finished and sent to up from the kitchen via dumbwaiter. Over the next few years, Horn & Hardart’s chief engineer, John Fritsche, redesigned the machine, maintaining the fundamental design of European models but tweaking it to the needs of American cafeterias. In 1906, Fritsche secured a patent for an innovative automat that held ready-to-eat dishes, which could be purchased and removed directly through a bank of clear glass windows four rows high. Menu items were stocked from the rear by kitchen staff. 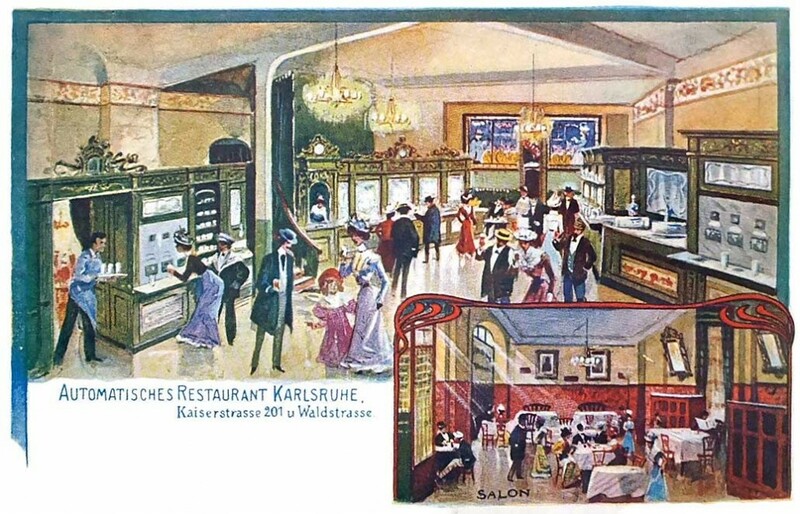 A 1903 postcard depicting an “automatic restaurant” in Karlsruhe, Germany. Image courtesy Restaurant-ing Through History. Fritsche further improved the device by adding a rotating vertical cylinder behind each stack of four glass-fronted compartments. When an item needed to be replaced, employees would load a dish into the cylinder from behind, then rotate it 180 degrees to reveal the item to customers. This alteration completed the separation between diners and those making their food, creating the illusion of a mechanical fount of plenty. Eventually, hollow chambers were added to the rotating drum so it could be filled with hot or cold water to maintain the food’s temperature while it sat on display. As Alec Shuldiner explained in his 2001 dissertation on restaurant technology at Cornell University: “The customer saw a wall full of glass-fronted boxes, each of which contained a serving of food … The worker behind the machine saw an array of large cylinders, each encapsulating four compartments and equipped with a lever indicating whether or not the chamber had been emptied.” The standard automat layout encouraged diners to “walk the walls,” referring to the process of window shopping to find exactly what one wanted to eat. 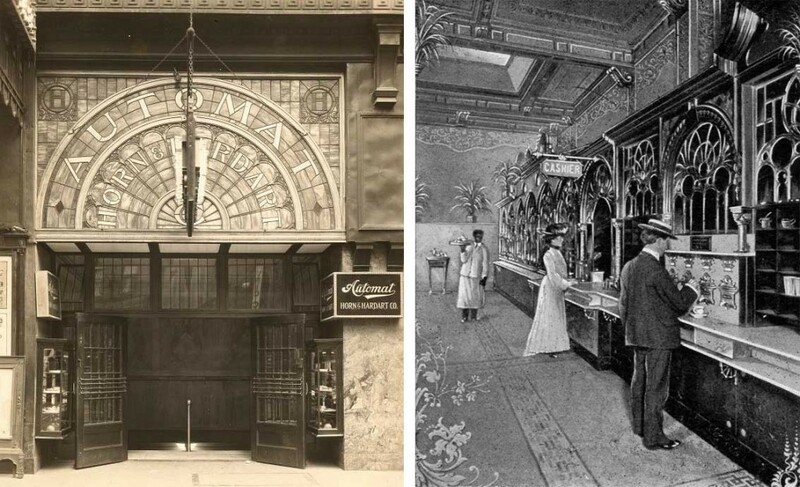 Left: Luxurious details in brass, marble, wood, and stained glass were common at the early Horn & Hardart automats. Right: An interior view of a Philadelphia Horn & Hardart cafeteria featuring Sielaff automats, circa 1904. An advertisement for a Horn & Hardart at 1557 Broadway in New York, circa 1915. Upon entering an automat, customers would head to one of the restaurant’s “nickel throwers,” who would give customers change to use at the banks of food-dispensing windows. “The most vivid and common memory that people have shared with me is of the amazing nickel throwers,” Hurwitz says. “Especially how, without even counting, the thrower could feel the exact change needed with her fingers. 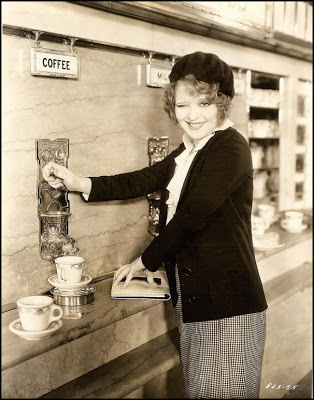 You’d give her a dollar, and she’d throw you 20 nickels across this beautiful marble or wooden counter.” Horn & Hardart’s machines accepted both nickels and quarters, though with such low prices, a few nickels often covered an entire meal: A cup of coffee was five cents; a ham and egg sandwich was ten. In 1908, Horn & Hardart established a central commissary where all the dishes could be prepared in advance and then dispatched via truck to the Philadelphia cafeterias several times throughout the day. Kitchen staff at each restaurant would then put the finishing touches on food before it was served. This assembly-line system enabled Horn & Hardart to keep its costs low, yet maintain its high standards at every new location they opened. 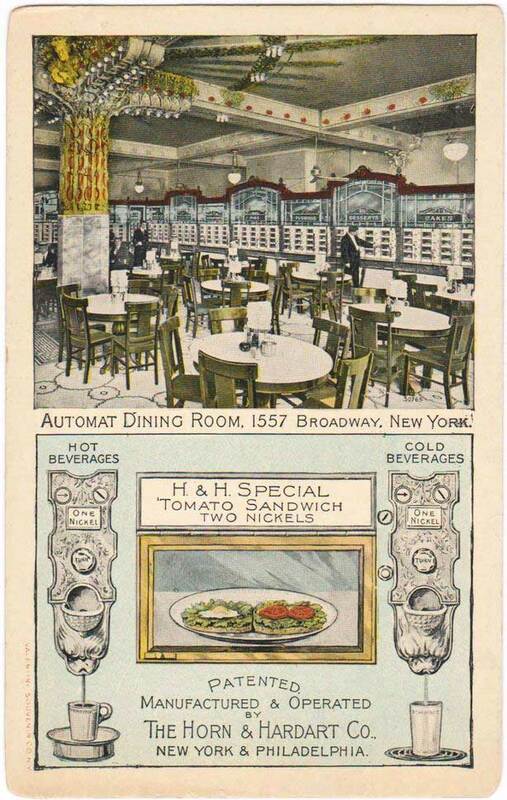 Although its name became synonymous with automat technology, many Horn & Hardart restaurants were typical cafeterias. In 1912, the company entered the New York dining scene with two of these standard lunchrooms, but soon after their launch, the duo purchased a larger property to debut the automat system in Times Square. For this flagship restaurant, Horn & Hardart spared no expense on high-end furnishings, even hiring artist Nicola D’Ascenzo to design a gigantic series of stained-glass windows featuring fruits and flowers. New Yorkers ate it up. A postcard guide to the automat, circa 1930s. During the 1910s, Horn & Hardart also attempted to expand to Boston and Chicago, but left the details up to local entrepreneurs who hadn’t previously worked for the company. Despite the large financial investments made in these cities, the locations only survived a few years before closing, even as their New York and Philadelphia locations were booming. Undoubtedly, a central reason Horn & Hardart failed in Boston and Chicago was that the central commissary structure used in Philadelphia and New York hadn’t been replicated. The answer was twofold: Beyond the speediness of automats, customers loved the process of selecting their own food—each diner could not only pick their favorite pie or casserole, but even the exact serving that looked most appealing. Since paying extra for good service was the norm by the 1920s, automats were also praised for eliminating tips. 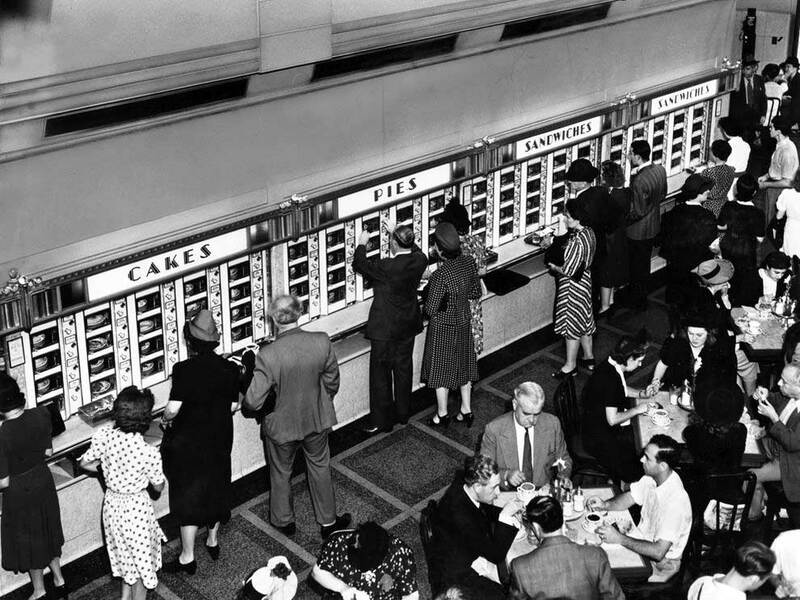 Like the Depression era’s glamorous Busby Berkeley musicals, the automat’s refined atmosphere helped people temporarily forget the nation’s woes. “It was absolutely a beacon of hope during the Great Depression,” Hurwitz says. “People who would’ve gone out to lavish dinners before the Depression were now frequenting Horn & Hardart. 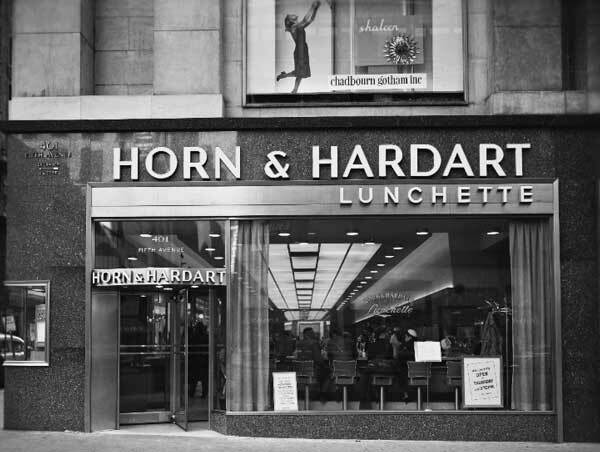 It was something you could depend on.” While many other cafeterias shut down following the stock market’s crash, Horn & Hardart was serving more than ever. A lively nighttime view of a New York automat captured for “Life” in the 1930s. One of the secrets to Horn & Hardart’s success was creating an atmosphere that was welcoming to all kinds of customers, with shared communal tables and a refusal to segregate customers based on class, race, or any other external marker. “From the very, very early years of the company, they employed people of all ethnicities,” Hurwitz explains. “I’ve talked to African American people who ate at the restaurants, and they attest to the fact that there was never any segregation. I spoke with somebody whose grandfather emigrated from Panama and spent his entire career in the United States working at Horn & Hardart.” However, African American employees were restricted to kitchen jobs that weren’t visible to the public, until pressure from the NAACP forced the company to integrate its waitstaff in the 1960s. Throughout the economic crisis, the chain’s consistent quality and upscale environs continued to draw affluent customers, while its low prices and friendly staff made Horn & Hardart popular among those who could barely afford a five-cent cup of coffee. “They advertised that everyone was welcome, no matter how much you spent,” Hurwitz says. 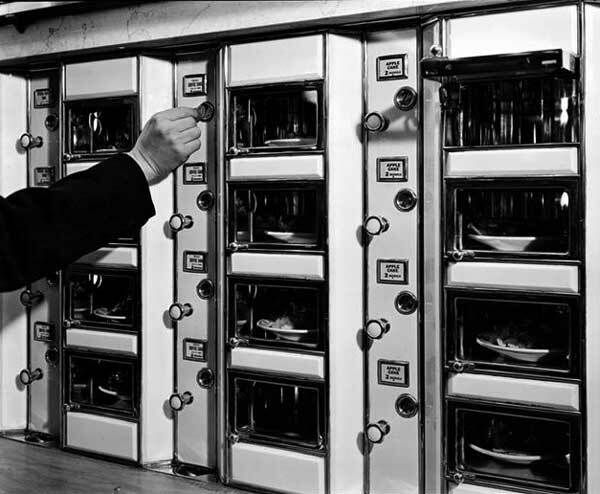 “They were also making large donations to relief organizations, like a day’s profit from one of their locations.” The Horn & Hardart automat became a kind of social experiment, where the upper crust might literally rub elbows with the homeless or unemployed. A customer makes his selection in this 1936 photo by Berenice Abbott. Via the New York Public Library. In contrast to the modern association of chain restaurants with bland, unhealthy meals, during Horn & Hardart’s prime, the food quality was one of its major selling points. “They used the freshest ingredients and served very wholesome, all-American food with lots of vegetables,” says Hurwitz. In 1933, Horn & Hardart hired Francis J. Bourdon as the executive chef for its New York City commissary. Bourdon had trained at Le Cordon Bleu in Paris and worked at famous restaurants in Monte Carlo, London, and Buenos Aires. Edward Hopper’s 1927 painting “Automat” hints at the isolating side of urban life. Via the Des Moines Art Center. 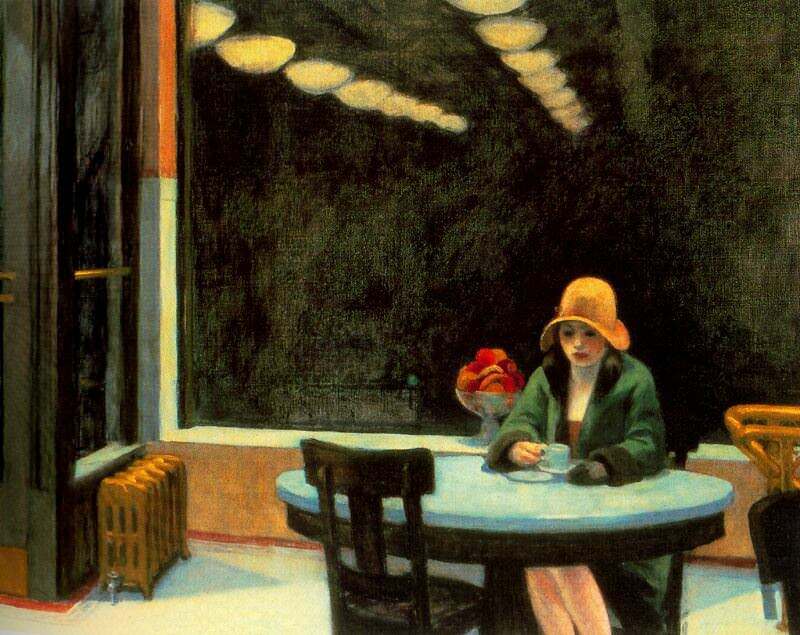 By the late 1930s, the automat had secured its place in popular culture—Edward Hopper’s painting “Automat” depicted a lonely looking woman staring into her coffee; parts of the Broadway musical “Face the Music” took place at the automat (Irving Berlin’s “Let’s Have Another Cup of Coffee” was eventually adopted as the Horn & Hardart theme song); several films included scenes at the waiterless restaurants. Even celebrities were sighted at the automat, likely because it offered a sense of anonymity. When Mayor Fiorello Laguardia of New York City instituted citywide “meatless days” during World War II, Horn & Hardart served tripe creole and kidney stew, creatively using the animal parts that weren’t limited. In the lean years of the war, the company also restructured the flow of its restaurants, altered menus due to low ingredient supply, and closed two locations to make up for the loss of male employees to the military effort. But by 1948, business was booming again. However, Horn & Hardart had new problems on its hands: Families were leaving the city for the suburbs, and modern style car-centric fast-food restaurants opened to serve them. New offices were building cafeterias in-house, and labor unions were pressuring Horn & Hardart employees to organize via direct threats, intimidation, and protests in front of several locations. On November 28, 1950, in the midst of these changes, Horn & Hardart raised the price for a cup of coffee from five cents to ten. “The cost of labor had increased so much, along with the cost of food,” Hurwitz says. “The subway and the public telephone used to be five cents, too, but they had already gone up, so it was time for Horn & Hardart to change.” Customers were not happy, and it showed with a major drop in sales. Meanwhile, with both of the original founders now long deceased, management became increasingly focused on profit, rather than the company’s value to the community at large. 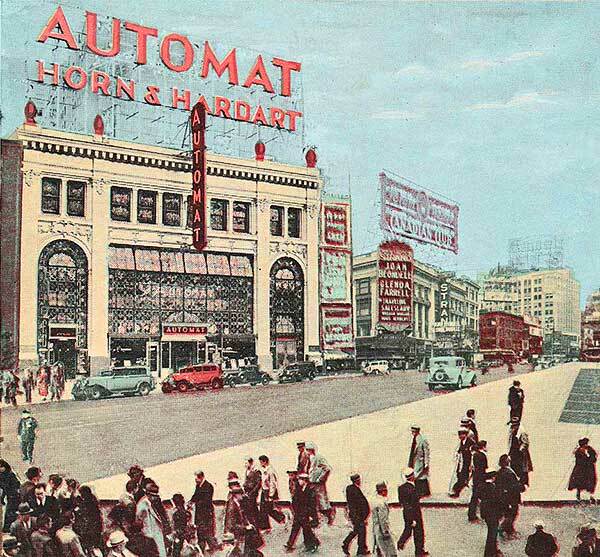 As automats began losing their lustre, Horn & Hardart tried several methods to keep out its poorest clientele, like instituting a strict minimum purchase price and installing one-way turnstiles between the cash register and dining room, but business continued to slump. “Eventually, because of inflation and rising costs, you couldn’t even use coins to get food at the automat—you had to pay for all of your food at a register,” says Hurwitz. 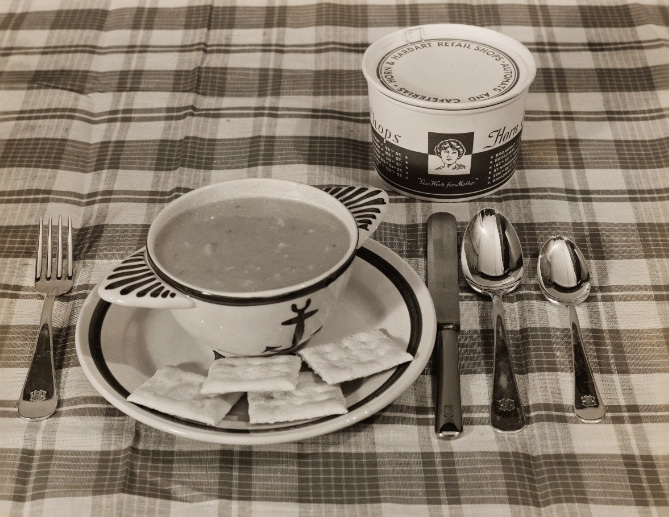 A promotional image of Horn & Hardart’s soup, circa 1940s. Via the New York Public Library. Horn & Hardart attempted to follow the exodus of its middle-class customers, planning for new locations (that never materialized) in suburban Pennsylvania, Delaware, and even Florida. As the number of eaters shrank, servings began to languish in their compartments, undermining the Horn & Hardart promise of freshness. To further cut costs, the company started freezing its entrees, another serious affront to longtime customers. 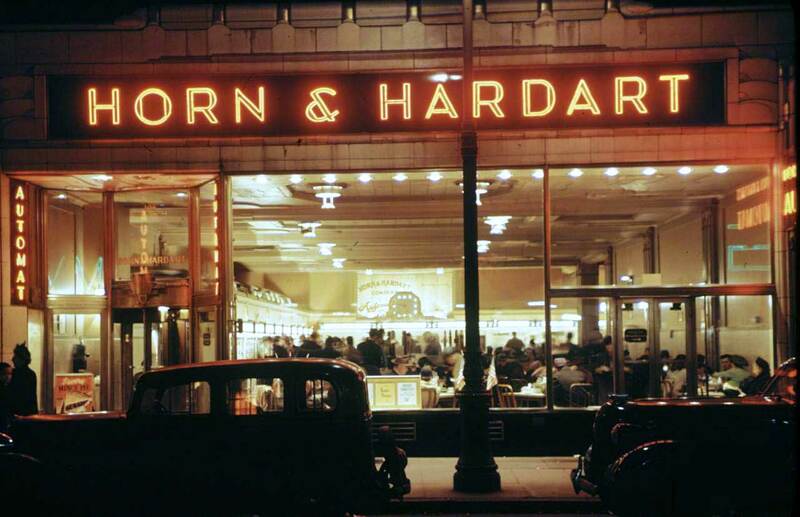 Finally, Horn & Hardart was forced to close its original Philadelphia location in 1969. Horn & Hardart attempted to modernize its image during the 1950s and ’60s, but still couldn’t hang on to customers. Via the New York Public Library. Americans turned toward the gleaming promise of McDonald’s golden arches, with its customizable processed food, leaving the frugal and dignified automats behind. In 1971, the Philadelphia branch of Horn & Hardart filed for bankruptcy, as it would again in 1981 and 1990. 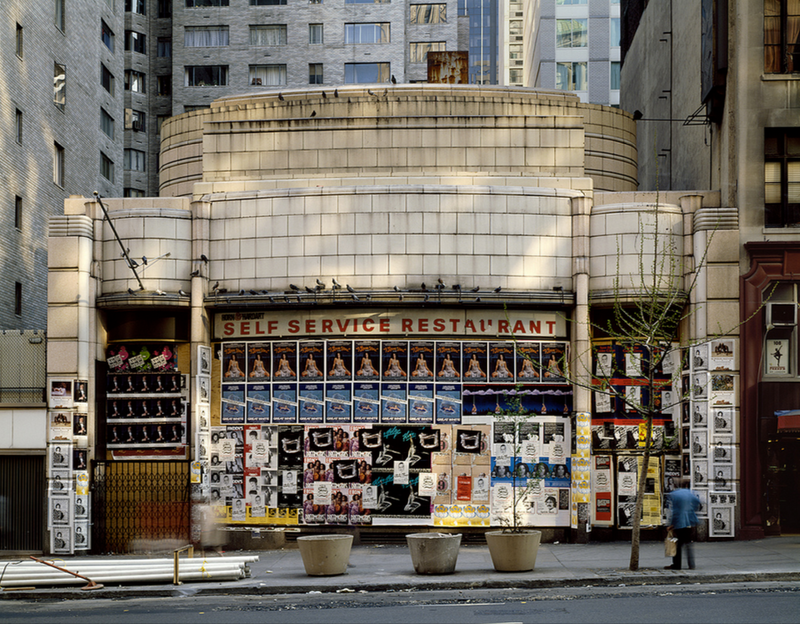 The last remaining automat, at 42nd Street and Third Avenue in New York, closed in 1991. Though many of today’s new business ventures are working to incorporate digital automation, including zero-waitstaff restaurants like Eatsa in San Francisco, Hurwitz thinks their ethos is very different than that of the original automats. Horn & Hardart’s defunct 57th Street location in New York, as seen in the 1980s. Via Carl Burton’s flickr. Thank you for featuring our documentary, The Automat! We still use these machines in the Netherlands. They are most commonly used for greasy fast food like hamburgers and deep-fried stuff that is being kept hot inside the automat. You can order the same items at the counter and get them freshly made, but most people like not having to wait or having to interact with another person to get a quick snack “uit de muur” (out of the wall). Tourists tend to think they are strange or funny, but they are really common and almost everyone will get a “kroket uit de muur” every once in a while. Some of the buildings survive in NYC. One is on 72nd St. near Broadway. One is on Broadway at 103rd Street. Thanks for this very in-depth article, which I’ve reposted to the Culinary Historians of Washington DC Facebook page. Horn and Hardart is part of my family legacy–my grandfather was a bookkeeper there and I still think about their great pies! Mr. Milton Fritsche became CEO of Horn & Hardart up until he retired. I was married to Thomas Dietrich Fritsche, the illegitimate son of Milton, until 1975. It wasn’t until Milton’s death that the truth was revealed. Thomas was always told that the was adopted. It was Milton Fritsche’s father that invented the automat. He did not want this name to become known. He was a was a very private man.